Rate cut lifts markets. The benchmarking indices had finally closed on a higher note expecting the RBI\'s rate cut would boost the growth. Mumbai: The benchmarking indices had finally closed on a higher note expecting the RBI's rate cut would boost the growth. The Sensex rallied over 400 points intraday trading but owing to profit booking in the last hour wiped out most of the gains. Before policy statement the markets lost over 1 per cent. 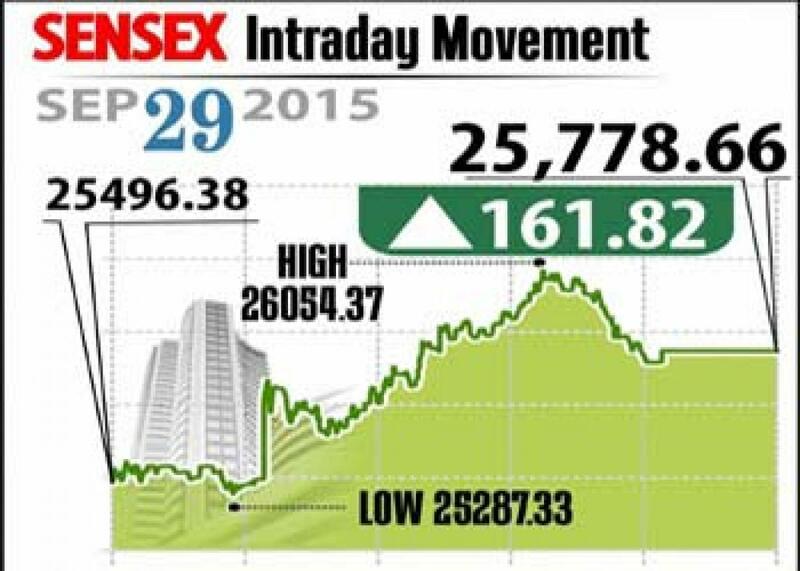 Sensex ended up 162 points at 25,779 and Nifty gained 48 points to close at 7,843. The broader markets closed on a mixed note with midcap and smallcap indices ended 0.4 per cent and 0.1 per cent, respectively. Analysts opined that the policy is more forward looking and trying to address the problems of slowing economy. On the sectoral front, rate sensitive sectors gained led by realty, banks and auto indices, however, metals, healthcare and Oil and Gas sectors declined marginally. While HDFC was the top gainer with 3.5 per cent higher, following monetary policy statement proposing to reduce the risk weights. Other housing finance companies benefited include LIC Housing, GIC Housing up by 6 per cent each. From banking space, HDFC Bank, ICICI Bank and SBI closed up to 1.2 per cent expecting credit growth, while auto stocks like Maruti, Tata Motors closed 1.2 and 3.1 per cent each. On the other hand, in pharma space, Dr Reddy's lost over 2 per cent, Sun Pharma down 1 per cent and Lupin fell 0.77 per cent. While L&T gained about 1 per cent as its subsidiary L&T Info filed IPO with Sebi. The gainers: HDFC, up 3.46 per cent at Rs 1,213.55; Maruti Suzuki, up 3.12 per cent at Rs 4,674.75; M&M, up 2.48 per cent at Rs 1,251.75; HDFC Bank, up 1.72 per cent at Rs 1,064.40; and Coal India, up 1.60 per cent at Rs 314.60. The losers: Vedanta, down 5.43 per cent at Rs 86.25; Tata Steel, down 3.87 per cent at Rs 201.35; Hindalco Industries, down 3.54 per cent at Rs 68.15; Dr Reddy's Lab, down 2.79 per cent at Rs 4,075.05; and Sun Pharma, down 1.21 per cent at Rs 850.40.